World’s leading hardware and PC system manufacturer Elitegroup Computer Systems(ECS)launched the main highlightedproducts, the world’s first mini PC powered by the Intel® Core™ M processor, education notebook as a niche productand intelligentgateways for IoT field on June 1stat Taipei Shangri-La’s Far Eastern Plaza Hotel. ECS has officially announced the opening of Computex 2015 which starts from June 2nd to June 6Th,and hopes to bring a new experience and vision to global media and customers. The opening of the press conference started with gorgeous LED lights and colorful laser dance performance which showing the futuretechnology of fashion. It symbolized ECS’sproducts not only state of art, but also applying on our daily lives. ECS president Mr. Sunny Yang and Intel GM Mr. Jason Chen inserted a future key, representing the cooperation between two companies. In response to the advent of IoT era, ECS has collaborated with Intel by launching intelligent gateways. By connecting the intelligent gateway and server, every single device is connected easily. In addition, the ECS building has a Demo site of IoT and currently exists in other related construction cases. In the future, with the application of intelligent gateways, ECS hopes to create Taiwan’s first intelligent school, hoping that this trend goes global. The new flagship LIVA Core is the world’s first PC to adoptIntel® Core™ M 14nm processor. It is the combination of performance and power saving, hitting the laptop market by storm by providing more choices for consumers. 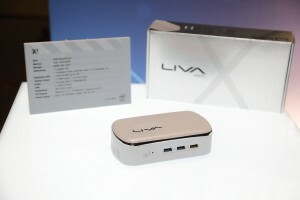 Brand new LIVA X2 sports a fashionable pearl white finish, breaking the concept of the traditional computer. In addition, ECS LIVA Core and X2 are the World’s first mini PC supporting Windows 10 Cortana voice assistance via native dual microphones. Emerging countries have a big demand on Education PC. While ECS has a close cooperation with Intel, focusing on opportunities of Education PC around the world. The profitability of niche product is stable. In this year, the focus onthe education notebook and tablet products makes ECS grow strongly in market, and we estimatenew ordersof education notebook and tablet products will help in the growth of shipments.